AMROTEC® X-Series Currency Discriminators are the most innovative, high-performance and user-friendly, ranges from single Stacker pocket to 1.5 pocket or 2 pockets having a dedicated reject pocket for non-interrupted operation and processing at an impressive high speed of 1000 to 1200 banknotes per minutes depending on models. These desktop portable counters provide various modes of denominating (recognition and value counting) and sorting operation for mixture of banknotes from Mix, Sort, Single, Face and Orientation operating modes and equipped with sophisticated suspect banknote detection sensors. They are designed to handle medium to heavy-duty cash processing requirements at financial institutions, retails, casinos and gaming market environment. Choose your models depending on your budget and need. 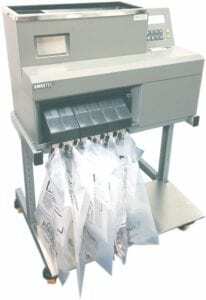 AMROTEC® offers high-speed Currency Sorters having 2 -3 main Stacker Pockets with a dedicated full Reject Pocket, which facilitates denominating and sorting of Mixture banknotes, ATM and FED Fitness Detection and sorting, separation of 2 -3 banknote Denomination into 2 – 3 Pockets as well as perform Facing and Orientation. Further, they are equipped with software capable of processing Casino barcoded Tickets and currency in mixture in one pass delivering into Separate Stacker pockets. 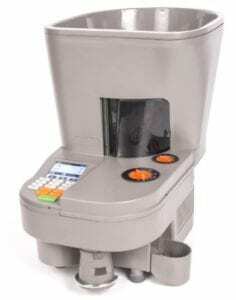 A dedicated Reject pocket is used for all non-recognized currency and tickets, suspect banknotes or unfit or non-assigned banknotes.The entire counting operation is performed non-interrupted without having to stop the machine, thus increases job-site productivity. 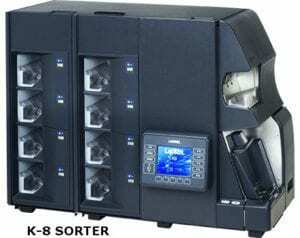 These desktop sorters are best suitable for small to mid-size financial institutions, small -mid range Casino operators and cash-in-transit businesses. 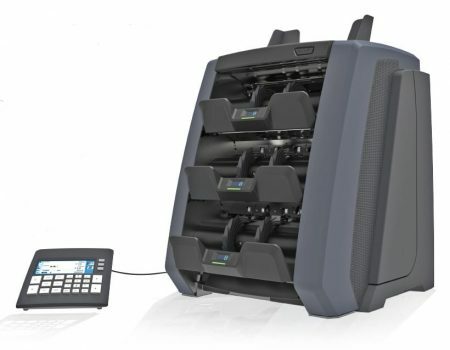 AMROTEC® offers Multi-pocket Currency Sorters ranges from 4 Stacker pockets up to 12 Stacker pockets with a dedicated full Reject Pocket, which facilitates denomination sorting of Mixture banknotes, ATM and FED Fitness Detection and sorting, as well as perform Facing and Orientation of banknotes. Further, they are equipped with the software capability of processing Casino barcoded Tickets and currency in mixture in one pass delivering into Separate Stacker pockets. Reject pocket is used for all non-recognized currency and tickets, suspect banknotes or unfit or non-assigned banknotes.The entire counting operation is performed non-interrupted without having to stop the machine, thus increases job-site productivity. 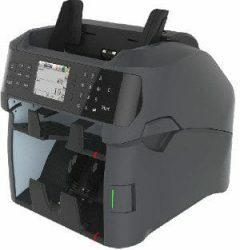 Best suitable for large volume operation at Financial institutions, Casinos and Cash-in-transit businesses. S-Series Coin Sorting machines are compromising of advanced Metal alloy sensing for coin recognition and with user-friendly User-interface for efficient coin sorting operation into 6 different pockets at a sorting speed of 700 coins per minute to 2000 coins per min depending on models. Whereas S-500 model is equipped with built-in large coin hopper and capable of handling medium to light heavy-duty coin processing job at financial institutions, gaming and vending industries, S-200 model is a Rail Sorter designed for low to medium-duty coin sorting operation. Both models count and sort all US coins and reject foreign coins, unspecified coins and certain debries to reject coin drawer. They not only batch at present batch number or by Full-bag per Federal Reserve bank giuidleine, they also display, store, print each denomination value, piece count and grand total to an external printer. AMROTEC® CC-Series Desktop Electronic coin counters are the most innovative, fastest and advanced of it’s category – ranges from Portable and compact for small-scale to medium duty coin processing (CC-01 model) to medium duty coin processing (CC-03). Besides counting of one denomination of coins each time, coin counters are also able to sort one denomination coins from mixture coins or package them by batch while sorting. Apply to all 6 denominating of US coins. 3″ Color LCD display (CC-Series) displays 2 lines of count and batching information – a latest innovation in this coin counter category. Other features include push button user-friendly keys control panel for counting and batching, batching upto 99999, adding, grand total and memory. These latest CC-Series are the first coin counters in this category to be included with USB (software upgrade) and RS232 printer port – connectivity to an External printer to print count results.